The Suncrown 5 Piece Wicker Outdoor Dining Set with 35″ Round Table is a modern, compact, great-value dining set that is ideal for smaller outdoor spaces. It will comfortably seat four adults for brunches, lunches, coffees and evening drinks, yet has a minimal footprint that is ideal for apartment balconies, or smaller outdoor spaces such as modestly-sized patios or porches. 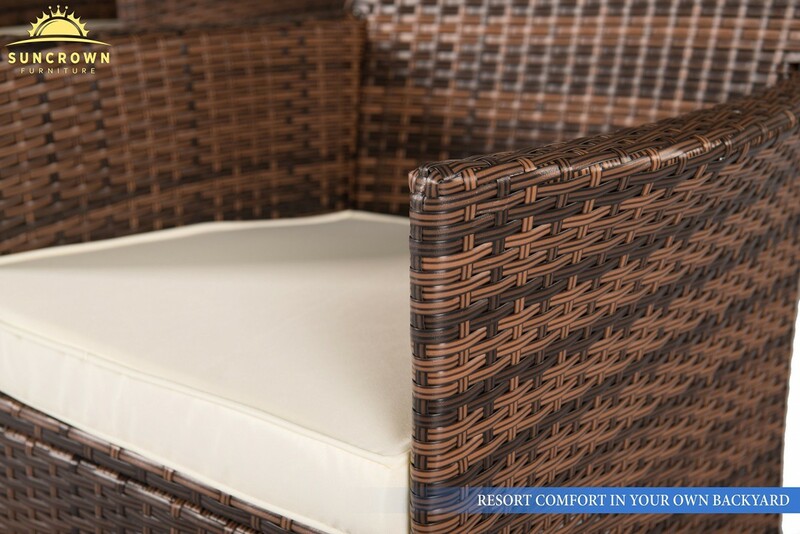 Featuring a round, 35.5-inch table as its centerpiece (a square table version is available here), the Suncrown 5 Piece Wicker Outdoor Dining Set comes complete with a tempered-glass table top, plus four matching wicker armchairs for relaxation, and four beige cushions for hours of comfort when dining and entertaining. 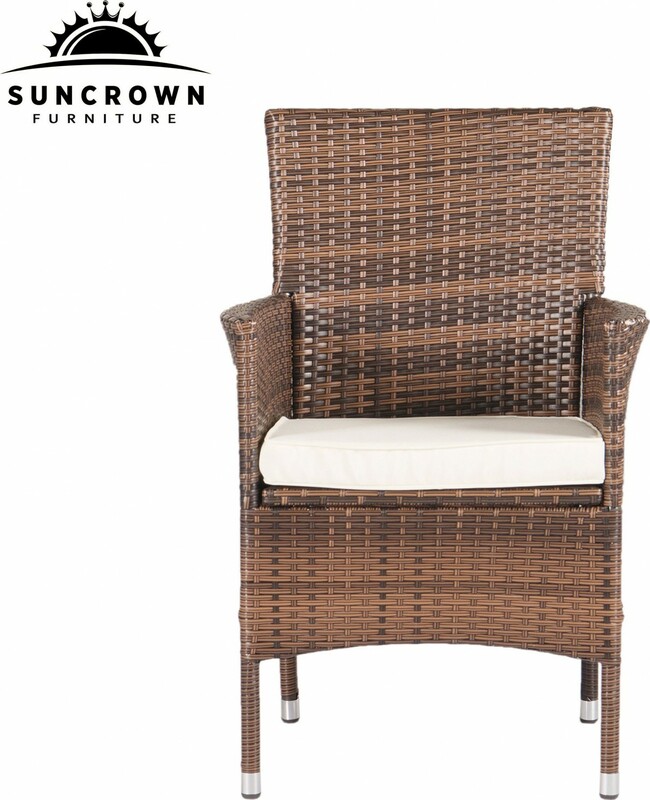 Constructed of a weather-resistant, checkered resin wicker, which is able to withstand a wide range of climates, the Suncrown 5 Piece Wicker Outdoor Dining Set with 35″ Round Table is extremely durable, and is great for both indoor and outdoor use — whether that be out on your balcony, patio or deck, or inside in a conservatory. Featuring a beautiful, black, tempered-glass table top, which sits securely inside the professionally-crafted dining table’s reinforced wicker edge, the Suncrown 5 Piece Wicker Outdoor Dining Set with 35″ Round Table is sure to add a certain ‘wow’ factor to your balcony, patio, deck or yard. Apart from its good looks, the tempered-glass table top also keeps your wine glasses and tumblers free from wobbles, makes cleaning a breeze (simply wipe over), and protects the wicker underneath from wear and tear. 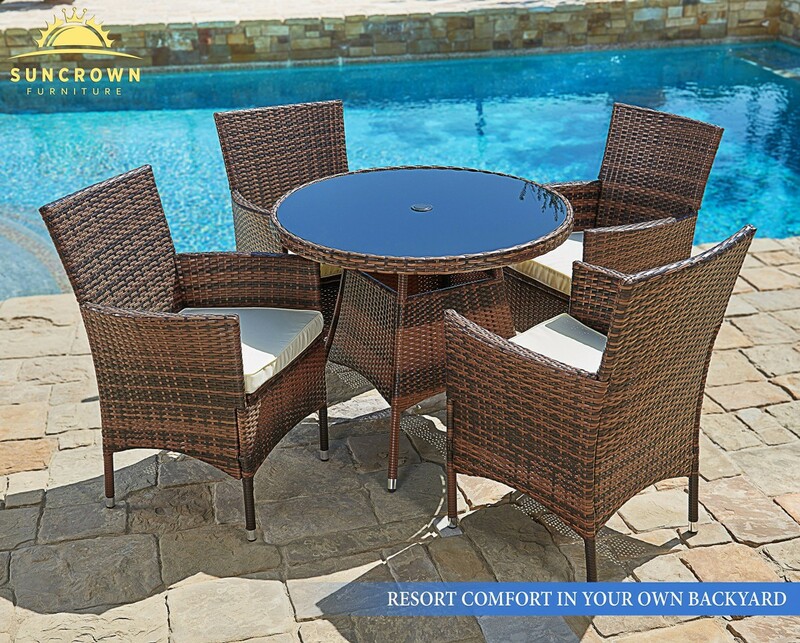 Including four ultra-comfortable, weather-resistant cushions that will provide hours of conversation and relaxation, the Suncrown 5 Piece Wicker Outdoor Dining Set with 35″ Round Table is a complete outdoor dining solution — which will liven up your outdoor space, providing an attractive and enticing spot for entertaining. 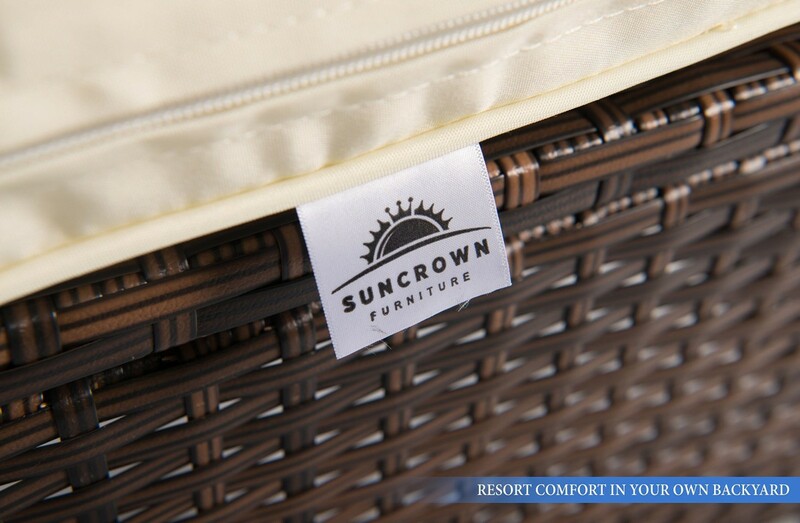 Including weather-resistant, unzippable, machine-washable cushion covers, which are easy to keep fresh and clean, the Suncrown 5 Piece Wicker Outdoor Dining Set with 35″ Round Table makes a practical and stylish addition to your outdoor (or indoor) space, that will see much enjoyment for many years to come. 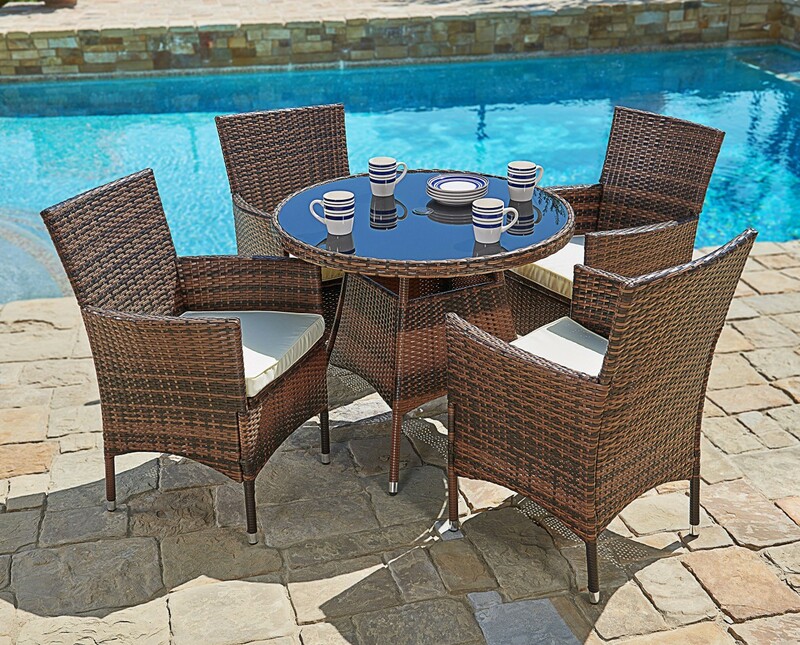 With strong, yet lightweight pieces that are easy to reposition, the Suncrown 5 Piece Wicker Outdoor Dining Set with 35″ Round Table is a breeze to move ’round your yard (or to spontaneously reconfigure to chase the sun), and provides comfortable seating that effortlessly pulls in and pushes out from the table (unlike more unwieldy sets). 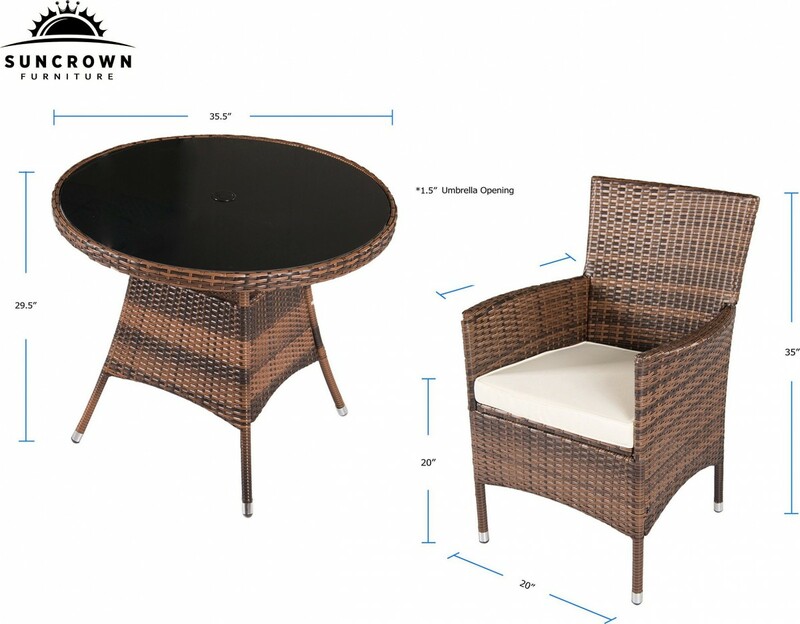 Including a 1.5-inch cut-out in the table top for an umbrella, to keep your guests cool on super-hot days, the Suncrown 5 Piece Wicker Outdoor Dining Set with 35″ Round Table also includes an umbrella hole cover, for when the umbrella’s not in use — keeping everything flush, level and aesthetically-pleasing. 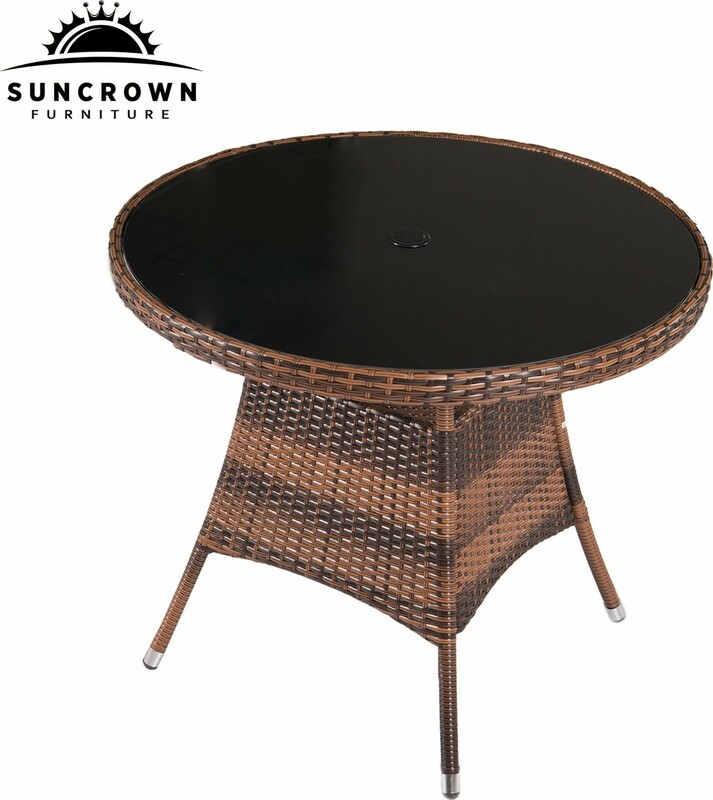 Including a sleek steel cap on each chair and table leg, finished with protective pads on the bottom, the Suncrown 5 Piece Wicker Outdoor Dining Set with 35″ Round Table protects the surfaces of your balcony, patio, deck or porch from potential marks and scratches, whilst also protecting the ends of the legs from undue wear. Made by a U.S. based brand, with an easy, 30-min assembly time and all tools and instructions included, the Suncrown 5 Piece Wicker Outdoor Dining Set with 35″ Round Table is an all-round winner for relaxing and entertaining in smaller spaces, and is a best seller over at Amazon.com (rated 4.3 out of 5 stars from 19 customer reviews) with FREE shipping. Click to see current price.